Right away you can see that the interface is drastically improved. More info is available on the screen at one time, and we can move through the other screens by choosing the corresponding button at the top. The Options screen gives us a slew of helpful warnings that we can adjust, plus some built-in checks for the Auto-Binding features. We can once again set the file paths for all our graphs and images, plus there’s some quick checks in there that are really useful. There’s a much updated Presets interface where you can set up distinct presets for different jobs. And now there’s a new screen where you can run a battery of tests before import and spare yourself a lot of repeat work. I go in-depth on all these features and a lot more in the 2 HOUR course! So make sure you head over and check it out. I know that might seem like along time to listen to me talking about Adobe Illustrator Variable Data, but unlike my YouTube videos, these videos are in bite-size chunks. I make sure to only teach one concept per video, so you can easily stop and start without having to start over from the beginning each time. Lynda.com is a membership site, so you’ll have to sign up to watch all of the videos, but luckily they have a free 10 day trial where you can watch my course and a bunch of others before the time runs out. While you can watch the videos, you won’t have access to my sample files to follow along with unless you upgrade to the premium membership. But if that’s not a big deal to you, the free membership will suit you just fine. If you want to follow along, you could always upgrade to premium for a month, and then bail out. You can always re-activate your account later if you need to (shhhhh!…I’ve done it before :P). 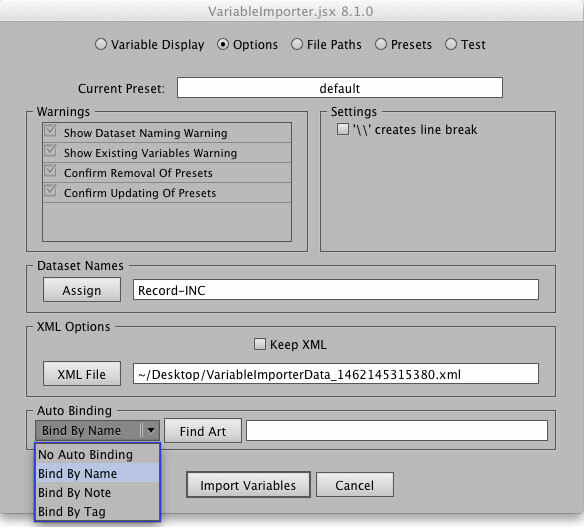 Adobe Illustrator Variable Data – What Is Variable Data? That should give you an idea of what the course is like, and hopefully you’d like to sign up and see more. Well, that’s about all for now. Make sure to let me know if you have any questions, comments or feedback about the course and I’ll do my best to answer them. Plus, if you know anyone who could benefit from the course, please clue them in, and share this around to help get the word out. There are some people out there doing things the hard way that don’t know they need this – I appreciate the help! 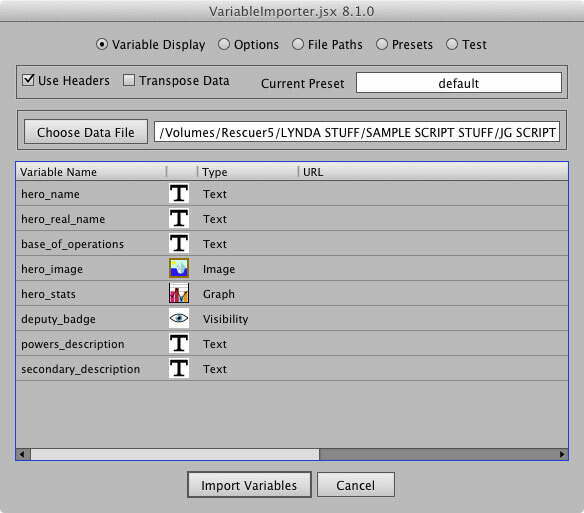 So finally, if you’re ready for your variable data projects to get even easier, then head over to www.variableimporter.com to grab the new script, and I’ll see you guys over there in the Adobe Illustrator Variable Data course on Lynda.com! This is what I needed to find am in the middle of a new website designed and have been using adobe Illustrator but needed to work out how to incorporate variable data thanks for the video tips and link will definitely be checking out Lynda.com. We are using a variety of programmes to automate a few of our products. We currently use macros to simply our data from the .csv that is downloadable from our eCommerce site. We then use an automation software to make certain images visible when needed and then the corresponding text entered on top. The issue is this program we currently use does not like vector. So we want to stick to illustrator as we need to group and nest each item after for our lazer cutter after. All the online tutorials seem to be showing just text and linked images. Instead can you use variable data to make shapes or layers visible when you want them? We have 50+ shapes that simply have a name in the middle of them. But the customer can chose the shape they want. Also can you get the text to change size dependent on the amount of characters? yes there is a “visibility” variable, and using the Variable Importer script, you can simply mark an “x” in your column when an object needs to be visible, and leave it blank when it should be hidden – you can also use boolean “yes/no” values, but I found it simpler to just use “x/blank”. I go over that aspect of it in the Lynda tutorial, so definitely check that out for more info. Also, Illustrator’s variable data feature isn’t robust enough by itself to auto-fit your text based on number of characters. For that you would need a custom script that could do that for you. I had Vasily Hall (the creator of the VI script) build me a custom script for a similar issue a couple of years back. It worked with text areas and would horizontally scale the text until it all fit into the text box. Hopefully this helps you out some! Please help! I’m having trouble when I import the variables as no objects appear? Any ideas? When you say the objects don’t appear, you mean they don’t change when you import? Which method are you using to bind the objects? Thanks for the great tutorial! It helped get me going but I am having an issue with my imported graphs. It appears to be an Illustrator issue, but everytime I import the variables, the graph data comes in no problem, but the font size for my labels change from a 10pt font to a 3pt font. So weird! It happens if I just update the graph data in illustrator also. any idea if this is a bug or something I’m missing? Also, how is the graph csv file supposed to be structured? I have a simple pie chart and the first row of my CSV is the labels, the second is the data for each slice. when I run the import it sees my first label as a number rather than a text, even though it is in quotes in the CSV file. When I run the import script it sees the first entry as a number rather than the text and on the pie it shows 10.00 rather than 10% for that slice, however the other three slices are fine. I’ve double checked the CSV files and all seems good. I had 3 test files I tried with this with and the same thing happens every time. This will force your legends to go back to the way you want them, clearing the overrides that would be caused when the graph updated. If you had steps like this in your action you could automatically fix your legends when you save out your separate files. Now, for your import problem. I’ve had trouble with that, too, honestly. You have the data going the right way as far as I can tell. Sometimes I’ve found that if I “inform” Illustrator that the first row is a label then it will always work. For example in the Graph Data window I’ll actually type my labels with in there with quotes around them, then click the checkmark to accept it. Once it has done that, I can import my data even though it doesn’t have any quotes in the header area – and by that I mean it’s just a raw text file (not even in Excel), so there’s no possibility that the quotes are added for me. Also try using the import button right in the Graph Data window and see if it comes in fine there. That’s another way I’ve found to kind of “instruct” Illustrator to how the file is *supposed* to look. Yes sorry to say, the styling for graphs is subject to special and different “graph rules” where only certain appearance styling sticks from the regular arsenal, and a fraction of that remains after a dataset change event. As for the first item in the legend being read in as a number, this is some code that will be definitely looked at to remedy this issue because it is indeed a reproducible and ongoing bug. 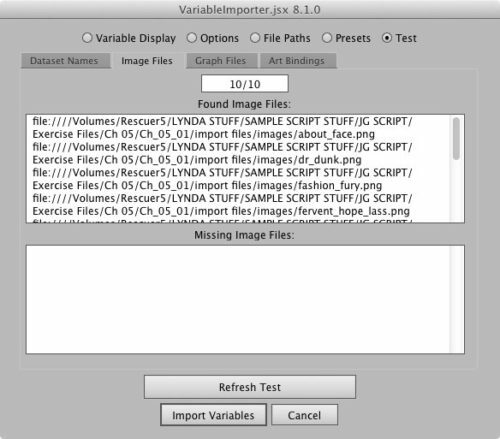 However, if you are able to use this latest VariableImporter hack, you can patch it on the data side by adding a couple XML character entities which stand for the quote character, around the first item like this: "10%"
haha! you two are too quick for me. I think Vasily’s character entities were mistakenly encoded by my site’s overzealous comments settings, lol. That should be &quot;10%&quot;, correct? Also, depending on your program, sometimes when you make the csv the software only encloses TEXT in quotes. When it’s a number like your headers, the cell can be considered a number category, and so is not quoted. Selecting your cells, and then setting the formatting to Text should help it to be quoted. If you open those csv’s up in a plain-text editor like Textwrangler (Mac) or Notepad++ (Win) then you should be able to see if the quotes are actually there. thank you!! I figured out what he meant by the coding and just tried it out – worked like a champ! So it looks like I have work arounds for both my issues, thank you both so much! Now if I can just figure out how to get illustrator to create a population pyramid using the limited charting capabilities, that would be great. Though I think that is beyond the scope of Illustrator at this point so I’ll set up an excel macro to create it there and export it as an image, then import it into Illustrator as an image. This is all for an infographic document I’m creating for 100 different areas. The basic data stays the same, but for the target area (these are commute sheds) I need to change the data. I knew there had to be a way to get this to work, and I was about to try InDesign, but being that I use Illustrator so much more this is great. oh forgot to mention that setting up a character style then having that applied just before the save in my Action worked as well. I had that typed in my reply originally, but you both were responding to before I posted it so re-wrote my post after I tried the xml character for the quote marks. 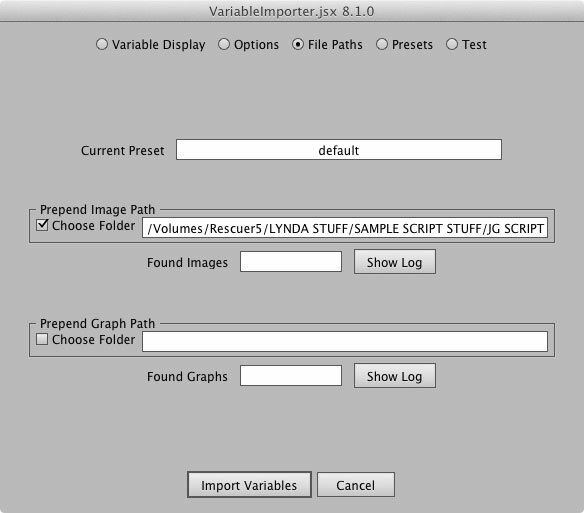 I’m trying to use the VariableImporter script for the first time. But it’s giving me an error: “There appear to have been no variable names in the data file ‘filename.csv'”. I’m not sure what I did wrong. I’m using a Mac. I created my table with Excel, the top row contains the names, I removed all commas, and exported it as a .csv. Excel wouldn’t let me add the “@” to the column header with image names so I added it in a text editor. 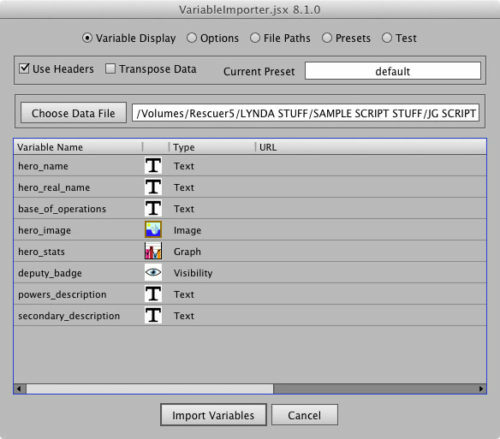 The variables in the Illustrator file are named the same as the column headers. when you say you removed all commas, you mean you removed them after the fact in the text editor? Or you just made sure your data had no commas in it? Normally as long as the fields are “quoted” as text then commas shouldn’t be an issue on import. As for your “@” symbol, in Excel you have to add an apostrophe right before the “@” in order to prevent Excel from turning it into a formula. I stumbled on that one at first too when using Excel. If none of that is helpful could you jump over to my contact form and send me a message through there? Then we can communicate via email and hopefully you could send the file so I can take a look at it. Hey thanks for the reply. About the commas, I just made sure, in Excel, that there weren’t any in the data. The apostrophe trick is good to know. I’ll add that. Hi, I manage to get the entire script to work perfectly except for 1 item. When I go to assign data set names I’m not able to use the variable names. They are not showing up in the dropdown menu. Did I miss a setting? Do you have the “Use Headers” button checked in the first “Variable Display” screen? If so, do all of your variable show up in the window on the first screen? Also, how did you save your csv file? Did you make sure to use commas (some programs might default to semi-colons or some other separator). Yes, the “Use Headers” button is checked and all the variables do indeed show up in the first screen. 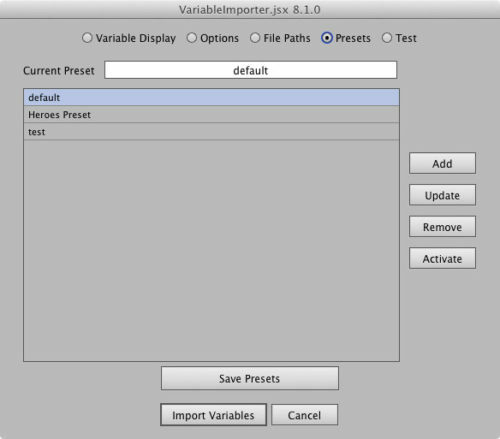 I have saved the csv file correctly and I’m successfully able to output all the values from it when I click the Import Variables button. I’m when I try to rename the Data sets, I only get “Custom Text, Nothing, Dash, Space, Increment, Underscore” in the dropdown menu as options. In the video it shows the dropdown with the variables as options as well. Hi Chris, are you using the latest VI version? Also, which Illustrator version and OS? Could be helpful. I’d like to take a look at your csv. If you don’t mind, could you click my contact link and send me a message through there? Once we’re in contact through email you could send me the csv so I can test it out. Just in case anyone comes across this thread, Vasily did some troubleshooting with Chris and fixed the problem. It turned out to be his screen magnification that was making it appear as if the variables weren’t available to choose for data set renaming purposes. This means that the screen was magnified in such a way that the bottom portion of the dropdown that would contain the variables was cut off. So they were there, but just invisible and inaccessible. The solution was to reduce the magnification for one time, save the settings as a preset, then restore the desired screen magnification. Hopefully if anyone else has this issue they stumble across this page. Hi, we just had someone with this very problem. It turned out their screen resolution was set too low and was cutting off the variable names in the dropdown. Can you try changing your resolution as a test and see if that fixes it? This sounds like an amazing resource and a very informative video John. Maurice! What’s up man? Thanks for checking in, and yes I was hoping this would be a great help to those Illustrator buffs who need to crank out this kind of work fast!